Put some Spring in your Stitch! Spring is upon us in Kansas! Yay! Warm breezes, birds singing, flowers blooming, blue skies, green grass – what a lovely time of year! To celebrate and to give you something bright, fun, and fast to stitch, I’m having a Spring Sale on ebooks in my shop! If you’re looking for something springy and colorful to stitch – especially for quick weekend projects – you might enjoy Lavender Honey & Other Little Things. Not only can you learn lots of stitches and techniques from these little projects, but you’ll learn how to finish them into useful items! For monogram lovers, Stitch Sampler Alphabet is a colorful and instructive option for learning some fantastic stitch combinations. The monograms can be worked up in no time, too, using threads from your stash. You have plenty of time to personalize some Easter gifts with bright and happy decorative initials. If you’re looking for monogram patterns to print, trace, and stitch, Favorite Monograms offers patterns for 16 complete, beautiful alphabets. And you’ll find plenty of stitching tips for many of the monogram styles right here. With Easter coming up, maybe you’re in the mood for some religious embroidery? Church Patterns is a collection of over 120 religious designs to embroider, including crosses, medallions, and other religious symbols. You’ll find several other ebooks available, too, to help you get your spring stitching underway! Feel free to browse through them all, and maybe you’ll find something that makes you itch to stitch. 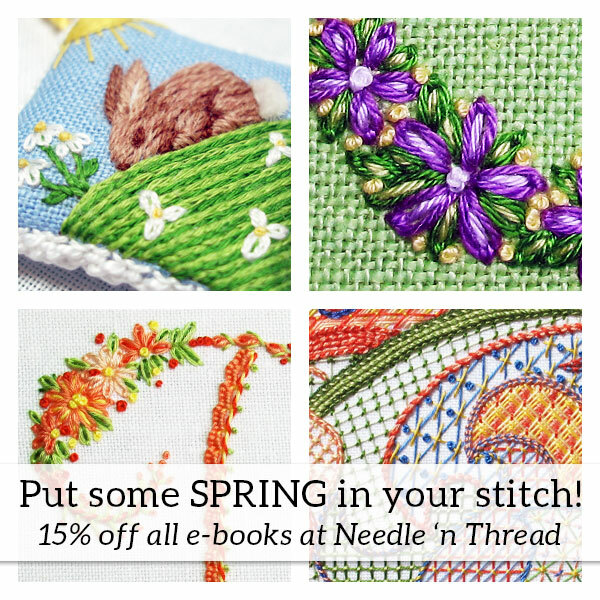 From now until next Saturday, April 1st, you can pick up any of the ebooks available in the shop on Needle ‘n Thread for 15% off. If you’re new to the concept of e-books, but you use a computer, they’re just as easy as opening up a PDF file. You’ll receive a download link after you complete your purchase, so that you can start stitching that very day! The download link is good for a limited number of downloads and days (for security reasons), so as soon as you get the link, click it to start your download. The file with automatically download to your downloads folder, and the PDF will open. If you don’t have a downloads folder, with the PDF open on your desktop, just go to File, scroll down to Save As, and save the PDF to your computer. From there, you can move it wherever you want to save it on your computer, tablet, phone, or what-have-you! To use the ebooks on a mobile device or tablet, it’s best to download them to your computer first and then move them to your device’s library and sync your device. This will ensure that they’re loaded right and that you have access to them through your device’s library when you need it. This will also ensure that you have access to the file on your computer, too, whenever you need it. You can view it on your computer or device, or you can print the whole file, or selected pages, whenever you want. And of course, if you ever have any problems, if you ever lose the file – no problem! I can help you out – I’m only an email away! Besides some project progress and a little more silk talk, I’ll be showing you a beautiful (antique) method of transfer and then stitch up a tiny project from it. I’ll also pass on some suggestions for making your own similar transfers. I’ll be sharing my process for planning a project from scratch and tracking its development. Fun stuff, for those who have patterns and want to know how to develop them into stitchable projects! And while I’m working on all that in the background, I’m anxiously awaiting the installation of a new hard drive on my computer. Yes, my hard drive died. Thank goodness for backed up data! Not spring here in NW lower MI by any means – not even crocuses though it’s been an exceptionally mild winter. But working on sunny colors of embroidery lifts the spirits on gray days! I did a needlebook from Lavender Honey which turned out beautifully, adding a monogram for the recipient, a dear friend, from your monogram ebook. And I have referred to the Stitch Sampler Alphabet book like a stitch dictionary many times. I’m now working on another needlebook with inspiration from the flowers of the stitch sampler. Can’t seem to stop stitching flowers since there’s none yet to be seen outside! Spring WILL come, Holly!! Perhaps not as soon as all the way down here in the “south” – but it will get there. Michigan is beautiful in the spring, so I can understand wanting it to arrive soon! I’m so glad you find the ebooks so handy! I have all your ebooks and they are great with lots of tips and techniques and I like the references to your how to videos on all the stitches in the ebooks. I’m looking forward to next weeks blogs on Antique transfers that sounds interesting and planning a project and pattern development. So sorry to hear your hard drive has died I hope your new one will be up and running soon. Have a nice springy weekend. Thanks, Anita! I hope you have a great weekend, too! I really spoke too soon on the weather – we’ve had gorgeous, warm weather all week. Then it rained a bit, so everything greened up when the sun came out. And then, later this morning, a low layer of clouds rolled in and the temperature dropped and it’s gloomy and chilly. On the bright side, good weather for getting inside things done! I’m so excited to learn you’re a Kansas girl too! Your vast encyclopedia of embroidery is without question the best resource available. Thank you so very much for sharing your knowledge & talent with the world free of charge. I would have never been able to learn so much without your patience & thorough instructions. Hola, Mary. Quisiera hacerte una pregunta. Recientemente he recibido de mi madre, que era una gran bordadora, una caja llena de hilos en madejas que toda la vida creí que eran todos de seda. Ahora, leyendo las etiquetas, veo que muchos son de rayón. La verdad es que son muy bonitos, hay gran cantidad de matices de rosas, verdes y azules. Solía ir con ella a comprarlos cuando era niña, entonces en Brasil, hará unos 50 años. ¿Qué uso les puedo dar? Ella bordaba con ellos y los usaba como hilos de seda. ¿Pueden usarse igual? La marca es Lisona. ¡absolutamente! Se pueden utilizar de la misma manera. Si las tienes, deberías usarlas!